North Carolina Central University is required by federal law to notify students annually of their rights under the Family Educational Rights and Privacy Act of 1974 (FERPA). FERPA provides that a student may inspect his or her education records. If the student finds the records to be inaccurate, misleading, or otherwise in violation of the student’s privacy rights, the student may request amendment to the record. FERPA also provides that a student’s personally identifiable information may not be released to someone else unless (1) the student has given a proper consent for disclosure or (2) provisions of FERPA or federal regulations issued pursuant to FERPA permit the information to be released without the student’s consent. The following categories of personally identifiable information about students have been designated as public or directory information that may be disclosed for any purpose without student consent: name, local and permanent address, email address, telephone number, date and place of birth, class, major field of study, dates of attendance, enrollment status, degrees and awards (including scholarships) received, participation in officially recognized activities and sports, weight and height of members of athletic teams, and the most recent previous educational agency or institution attended. Directory information does not include a student’s Social Security Number or student identification number. Under FERPA, the student has the right to request that the disclosure of directory information be withheld. (Currently enrolled students may request that the university withhold disclosure of directory Information by completing the appropriate form available in the Office of the Registrar. A request for non-disclosure will be honored by the university indefinitely, unless the student submits to the University Registrar a written revocation of such request for non-disclosure). The university may also release personally identifiable information from student education records without the student’s consent to school officials who have a legitimate educational interest to access the records. “Education records” mean records that are maintained by NCCU in any media (e.g. paper, electronic, digital image, film, video, audio tape) that contain information directly related to a student and are personally identifiable to a student. Education records do not include 1) personal records of university employees that are in the sole possession of the maker, 2) records of the NCCU police department used for law enforcement purposes, 3) student medical and counseling records maintained and used only in connection with provision of medical treatment or counseling of the student and are made available only to the individuals providing the treatment, 4) employment records unrelated to the student’s status as a student (these records are covered under the N.C. Personnel Records Act), or (5) records that contain information about a student after he or she is no longer in attendance at the university. “School official” means: 1) an employee, agent or officer of the university or the University of North Carolina’s Office of the President or General Administration in an administrative, supervisory, academic or research, or support staff position and acting in his or her official capacity, including a student assisting another school official in performing his or her tasks, 2) a person serving on university committees, boards, and/or councils, including a student serving on a disciplinary or grievance committee, 3) another educational institution that requests records for a particular student who seeks or intends to enroll, and 4) a person or company with whom the university has contracted (e.g. internship and clinical facilities, attorney, auditor, or collection agent), but limited to only the specific student information needed to fulfill the contract. “Legitimate educational interest” means the function of a school official who is performing an authorized task or an activity that he or she is undertaking in the name of the university for which access to an educational record is necessary or appropriate to the operation of the university or to the proper performance of the educational mission of the university. If a student believes that the information contained in his/her education records is inaccurate or misleading, or that it violates privacy or other rights, the student may request that the university amend the record. Such request shall be in writing addressed to the registrar, and shall specify the amendment sought. The registrar or his/her designee shall, within 30 days after receiving the student’s request, and after consulting with appropriate university officials, decide whether the record will be amended in accordance with the request, and inform the student. If the decision is to refuse to amend the record in accordance with the request, the registrar shall simultaneously advise the student that he/she may request a hearing to challenge the content of the education record to ensure that the information therein is not inaccurate, misleading, or otherwise in violation of the privacy or the rights of the student. Students who believe that the adjudications of their challenges were unfair or not in keeping with FERPA, may request in writing assistance from the chancellor. Further, students who believe that their rights have been abridged, may file complaints with the Family Policy Compliance Office, U.S. Department of Education, 400 Maryland Avenue, SW, Washington, D.C. 20202, concerning the alleged failures of the university to comply with the law. All new students (first-time college students and transfer students) are required to attend an orientation program after they are admitted to the university and prior to the semester they enroll. Orientation sessions are scheduled for May, June, and July for those enrolled for the Summer and Fall semesters and in January for those enrolled for the Spring semester. The primary purpose of the Orientation program is to equip students and families with the necessary information to successfully transition into NCCU life. They will have the opportunity to engage with the university community, register for classes, tour the campus, and receive answers to pertinent questions. Students will register for a particular session and will then be notified confirming the arrival date, time, and location. This is an opportunity for New Eagles to get a flying start as they begin the next phase of their lives! Academic advising is an integral component of the educational experience at North Carolina Central University. In concert with the mission and goals of the university, academic advising is open to all students in all academic departments, schools, and colleges. One of the main purposes of academic advising is to assist students in reaching personal and professional goals. Students are expected to meet with advisors several times per semester. Students with freshman and sophomore credit hours are advised within University College, a unit devoted to student success and support during the period of transition into the university. A signed advising syllabus between the University College advisor and student provides guidance in terms of what the student needs to do in order to be successful in their academic pursuits. It is important that students sign in each time they visit their advisor. While academic advisors are available to assist students in making course selections as well as providing additional resources for student success, the student is ultimately responsible for his/her success. The university strongly expects students to become familiar with graduation requirements for their chosen majors, to meet with their academic advisors on a regular basis to discuss their academic progress, give their academic work the highest priority, and carefully plan course selections and sequences. Carefully following these expectations and forming a strong working relationship with an assigned academic advisor can ensure student success and graduation from NCCU. Students complete the registration process via Banner Self Service (SSB). Students use the Eagles Online (EOL) website to access Banner SSB. Banner SSB is available for registration during the period of time set forth by the academic calendar each semester. Additionally, Banner SSB affords the opportunity for students to register, to view class schedules, NCCU transcripts, student account information, financial aid information, grades, and to track their academic progress. Students are required to meet with their advisors to discuss curricula plans and course schedules. The Alternate Personal Identification Number (PIN) is used during the registration process. The Alternate PIN is the property of the university and faculty members and advisors issue the Alternate PIN to the student once the student has been properly advised to complete the registration process. The Alternate PIN is changed each semester to insure security and to encourage students and advisors to meet at least twice each academic year to review the students’ progress. As designated by the academic calendar, the registration period officially ends on the day designated as the last day of late registration and schedule adjustments. Course schedules will be canceled for students who do not make satisfactory payment arrangements on or before the registration ending date. Late fees for registration are imposed on the date indicated on the academic calendar. Classes may not be added or dropped after the last day for schedule adjustments as indicated in the academic calendar. A minimum full-time course load for an undergraduate student during fall and spring semesters is 12 credit hours and 6 credit hours in the summer. The maximum course load for which a student may register during fall and spring semesters is 18 and 12 credit hours during the summer. Students may petition their dean for permission to exceed maximum course loads. It is highly recommended that students enroll in at least 15 hours each fall and spring semester to graduate in a timely manner. CAUTION: Carrying less than a full-time course load may affect financial aid eligibility. Students who plan to take less than a full-time load should check with the donor of their aid or with the NCCU Office of Scholarships and Student Aid. Aid may be withdrawn if the academic load is less than full-time. The student will then be responsible for the payment of any tuition and/or fees. Students with a 3.0 or better cumulative grade point average may be allowed to carry a maximum of 21 semester hours with the approval of the dean of their college or school. Students with less than a 3.0 cumulative grade point average may not take more than 18.5 hours in a single semester. Under no circumstances will a student be allowed to register for more than 21 hours in a single semester. During the late registration period, students may drop and/or add courses with the approval of the faculty advisor and the dean of their college or school. Undergraduate students may add and drop courses using the registration system during the first 5 business days of the fall and spring semesters; however, students are responsible for insuring that any registration schedule changes do not result in less than a twelve-academic credit hour semester unless intending to be part-time. Students are permitted to drop classes online until 4 p.m. of the last day of the drop/add period. After the end of the drop/add period, students may not add a class or change sections. Also, they will not receive a refund or adjustment for the amount owed or paid for classes dropped. Students may withdraw from individual classes with the permission of the academic advisor by presenting a signed withdrawal form to the Registrar’s Office until the last day for students to withdraw from classes without academic penalty as governed by the academic calendar. However, there will be no adjustment in bills if classes are withdrawn during this period. The grade received for these withdrawn courses will be “W” (withdrawal from a course). Undergraduate students may not withdraw from courses after the date designated in the academic calendar as the last day to withdraw from a course. Students who do not attend classes after the last date for withdrawing from courses are withdrawn from the non-attended classes and will receive the grade of “NF,” which is the equivalent of an “F” when calculating a student’s grade point average (GPA). CAUTION: Withdrawals from courses may affect eligibility for financial aid regardless of the grade assigned to the withdrawn course. Students should check with the donor of their aid or with the NCCU Office of Scholarships and Student Aid before withdrawing from a course. Students may change their status in a course from credit to audit only before the end of the official drop/add period. Any course not declared as an “audit” course by the last day of drop/add will count as a credit course on the student’s academic record. See “Auditing Courses” for the complete procedures to declare an audit. The appropriate North Carolina Central University officials may remove a student from class or authorize enrollment in additional classes when such changes are necessary to conform with North Carolina Central University or the University of North Carolina policies. A scheduled class may be canceled if a sufficient number of students do not register for the class. The meeting time for previously scheduled classes may be changed with proper authorization. Students affected by such changes will be given the opportunity to move to another class or will be allowed to drop any affected classes during the first week of the fall and spring semesters, or the first two days during a summer session, after receiving notice of such changes without penalty. All work accepted for transfer credit must be at least a “C” grade and will be treated as semester hours earned. The grades a student earned on transferred work will not be recorded on the academic transcript of the student’s work at NCCU and will not count toward the student’s grade point average (GPA). However, the transferred hours will count towards the maximum of 168 semester hours that a student may attempt as an undergraduate. Students transferring from a two-year institution may receive up to a total of 64 semester hours of academic credit from all institutions attended. Extension courses, advanced placement, CLEP credit, and military service credit are included in this maximum. Students who transfer from a four-year accredited institution may receive any number of semester hours of academic credit from all four-year institutions attended. These students, however, must meet the 30-semester hour residency requirement before receiving their degrees from North Carolina Central University. Students who transfer to NCCU and who request financial aid must also submit for evaluation an official financial aid transcript from all schools attended previously. In keeping with the mission of the university, Academic Support Services provides assistance and support and gives students an opportunity to achieve maximum success. These services are designed to assist students in enhancing their academic performance in all subject areas. The services provide students the opportunity to develop relationships with counselors, faculty, tutors, supplemental instruction leaders, peer mentors, librarians, and other resource persons on the campus. Students will receive encouragement to internalize and apply learning experiences to classroom assignments and everyday living. Positive approaches to teaching and learning are emphasized to improve academic skills and the acquisition of knowledge. All students will have access to the following services: individual and group tutorial sessions, mandatory academic advising, electronic tutoring, transfer students’ services, individual and group study programs, “how to study” programs, supplemental instruction, engagement sessions, curriculum monitoring, computerized learning programs, counseling services, developmental skills programs, and class attendance monitoring. Students who avail themselves of these services will have an enhanced sense of personal responsibility for maintaining satisfactory progress toward graduation from North Carolina Central University in a timely manner. North Carolina Central University is dedicated to instilling in its students the highest principles of integrity and responsibility. In this regard, students are expected to demonstrate respect for these principles in the performance of their academic activities. Academic dishonesty, which is a violation of academic integrity, will be dealt with according to the provisions of the Student Code of Academic Integrity. Academic dishonesty is defined as any conduct which is intended by the student to obtain for him/herself or for others an unfair or false evaluation in connection with any examination or other work for academic credit. Cheating, fabrication, plagiarism, and complicity are examples of conduct that is academically dishonest. Cheating is the unauthorized use of materials in connection with an examination or other work for academic credit, including but not limited to: (1) the use of books, notes, outlines, etc., during an examination where the instructor has not authorized use of such materials or information; (2) seeking unauthorized materials or information from others in connection with an examination; (3) giving or attempting to give unauthorized assistance to a person in connection with an examination; (4) obtaining or attempting to obtain unauthorized copies of examinations; (5) bringing to an examination, or attempting to use during an examination, unauthorized answers which have been prepared before the examination period; (6) copying or attempting to copy the work of another student during an examination; (7) the use of electronic equipment or media to provide unauthorized assistance to oneself or others; and (8) submitting for evaluation in a course, part or the whole of a work for which credit has been given previously. Fabrication is the intentional invention, counterfeiting, and/or alteration of quotations, data, procedures, experiments, sources, or other information for which the student claims authorship in an exercise which he or she submits with the expectation of receiving academic credit. Plagiarism is the intentional use of the ideas, words, or work of another without attribution when the information they provide is not common knowledge, either in content or form, and includes but is not limited to: (1) quoting from the published or unpublished work of another without appropriate attribution; (2) paraphrasing or summarizing in one’s own work any portion of the published or unpublished materials of another without attribution; and (3) borrowing from another’s work information which is not in the domain of common knowledge. Complicity is the intentional giving of assistance or the attempt to give assistance to another for the purpose of perpetrating academic dishonesty. For an academic dishonesty act committed in an exercise counting for up to 10% of the final grade, the penalty will be the grade of F/Zero for the entire exercise or parts of it. For an academic dishonesty act committed in an exercise counting for between 11% and 24% of the final grade, the penalty will be the grade of F/Zero or a reduced grade for the exercise. For an academic dishonesty act committed in an exercise counting for 25% or more of the final grade, or for final examinations and papers, the penalty may be as severe as the grade of F for the course. However, the penalties for refusing to respond or failing to respond within 48 hours to the formal charge of academic dishonesty will be an automatic F/Zero for the exercise in cases of category (a) or (b) above, and an automatic F/Zero for the course in cases of category (c). In addition, the charge of academic dishonesty will stand and will be recorded on a student’s academic transcript. The dean of the school shall check the records of all students reported for academic dishonesty and refer all cases involving a second offenses of academic dishonesty to the Academic Integrity Board. The penalty for a second act of academic dishonesty committed any time before the offender’s graduation may be as severe as suspension or expulsion. Academic Misconduct - Any violation of the “Undergraduate Student Code of Academic Integrity” for undergraduate students or any violation of the comparable policy for the graduate or professional program in which the student is enrolled. Non-Academic Misconduct - Any misconduct that is non-academic in nature and that violates the Student Code of Conduct in force at the time of the infraction. An early warning is issued during the fourth week of the semester for any student performing below the grade of ‘C’. Mid-term grades are issued for students performing below the grade of ‘C’. Any undergraduate student whose GPA falls below 2.0 for any semester will receive a letter of warning from the dean of the college or school in which the student’s academic program is housed. Undergraduate students’ academic standing will be based on both the percentage of attempted credit hours completed (Satisfactory Academic Progress) and the cumulative grade point average (GPA). Failure to meet either of these requirements for Good Academic Standing at the end of each enrolled term at NCCU, to include fall, spring, and summer, will result in Academic Warning, Probation, Suspension, and Dismissal. Undergraduate students who do not earn a minimum 67% of cumulative hours attempted and minimum 2.0 cumulative GPA will be placed on Academic Warning for the following enrolled term at NCCU, to include fall, spring, and summer. Students who do not achieve the minimum 67% of cumulative hours attempted and minimum 2.0 cumulative GPA at the end of the Academic Warning term will be placed on Probation for the following enrolled term at NCCU, to include fall, spring, and summer. Students on Academic Warning or Probation who return to Good Academic Standing but later fall below the minimum 67% of cumulative hours attempted and minimum 2.0 cumulative GPA in a subsequent semester will return to the same sequence of being placed on Academic Warning and then Probation. Students who do not achieve the minimum 67% of cumulative hours attempted and minimum 2.0 cumulative GPA at the end of the Probation term shall be Suspended from NCCU for a period of two consecutive terms to include fall, spring, and summer. Students may appeal their Suspension to the Dean of their academic school or college. Suspended students with an approved appeal may enroll on Probation for an additional semester. Suspended students without an approved appeal must sit out of NCCU classes for a period of two consecutive terms. After the required two-term absence, Suspended students may apply to the university to be readmitted on Probation. The Dean of the academic school or college renders the decision whether to readmit students not in Good Academic Standing. Students approved to be readmitted after Suspension who do not achieve the minimum 67% of cumulative hours attempted and minimum 2.0 cumulative GPA at the end of the Probation term shall be Dismissed from NCCU. Students may appeal their Dismissal to the Dean of the academic school or college. Dismissed students with an approved appeal may enroll on Probation for an additional semester. The only options for return to the university for Dismissed students without an approved appeal are after an absence of three years under the Academic Forgiveness Policy, or with completion of an Associate’s degree from a North Carolina Community College under the Comprehensive Articulation Agreement. Students who have been Suspended or Dismissed and not approved for readmission by their Dean are ineligible for readmission to NCCU under the Special student status category-including during the summer term-except if enrolling as a Visiting student with documentation from the home university listing approval of courses to be taken. Academic transcripts are permanent records documenting student performance in courses and degree programs completed at the university. Transcripts are maintained in the Office of the Registrar and printed on authentic tamper-protected paper; they are official documents of student matriculation, course-work and degrees completed at the university. Transcripts will be transmitted to third parties only in strict accordance with The Family Educational Rights and Privacy Act and only for those students who have no outstanding financial balances with the university. Official transcripts contain notations regarding grades for academic work taken at the university, transfer credits accepted, academic probation and academic suspension, administrative withdrawal, degrees earned at North Carolina Central University, and appropriate identifying biographical information. Notations of academic misconduct and non-academic misconduct shall not be recorded on transcripts or retained by the Office of the Registrar except for notice of expulsion. Notations of academic performance deficiencies shall remain on transcripts. Official files regarding disciplinary actions will be maintained in the Student Rights and Responsibilities Office. As with academic transcripts, a student’s disciplinary file will be released to third parties in a manner consistent with The Family Educational Rights and Privacy Act. Notations regarding academic misconduct and non-academic misconduct, except for expulsion, shall be removed from all academic transcripts. Students are expected to be present and on time at all regular class meetings and examinations for the classes for which they are registered. Each instructor is Class attendance is expected of students at North Carolina Central University and represents a foundational component of the learning process in both traditional on-campus and online courses. Students should attend all sessions of courses for which they are registered for the entire scheduled period and are responsible for completing all class assignments. Instructors will keep attendance records in all classes. Instructors must clearly state on the syllabus how class attendance will factor into the final grade for the course. Faculty will include a written statement of the attendance guidelines in their course syllabi and will review the guidelines during the first class session. As of Fall 2017 NW and NF attendance grades will no longer be assigned. If a student misses three consecutive class meetings, or misses more classes than the instructor deems advisable, in addition to entering the information into Grades First, the instructor will report the facts to the student’s academic dean for appropriate follow-up. Students who miss class to participate in university-authorized activities are given excused absences for the missed class time. It is the student’s responsibility to inform the instructor of such activities at least one week before the authorized absence, and to make up all work as determined by the instructor. The University policy on class attendance must be included on all course syllabi. North Carolina Central University recognizes that the enrollment of some students may need to be discontinued for reasons beyond the control of the student. The purpose of the policy on withdrawal is to provide guidelines for establishing the basis for such withdrawals and for determining the course grades, eligibility for refunds, and satisfactory progress for financial aid in such discontinuations. A student is allowed to withdraw from any class for any reason (and receive a grade of W) after the end of the drop/add period and until the published deadline for withdrawing from class(es), not exceed 16 credit hours. Course withdrawals prior to fall 2014 are excluded from the 16 credit hour limit. Students may request withdrawal with extenuating circumstances for one or more courses due to serious and compelling reasons, such as an accident or serious illness, where the cause of withdrawal was due to circumstances clearly beyond the student’s control. Courses will count as attempted hours but not towards tuition surcharge or GPA calculations, and are subject to all financial aid and SAP rules and calculations. Students may submit an appeal to the dean or the designee of their college/school for evaluation. Appeals of a negative decision are handled by the Office of the Provost. Medical/Psychological - Statement from physician or therapist on letterhead including dates of service and whether or not the student is stable and ready to return to the University. Personal/Family Emergency - Medical documentation or statement from physician on letterhead including dates of service; Notarized statement from parent or family member. Death of a Family Member - Copy of an obituary, funeral program, or certified death certificate; Statement of the relationship between the student and the deceased to accompany the obituary or funeral program. Domestic Violence/Sexual Assault - Copy of policy report or court/legal documents; Statement from physicians or therapists on letterhead including dates of service and whether or not the student is stable and ready to return to the University. Serious Car Accident - Copy of police report; Medical documentation or statement from physician on letterhead including dates of service; Documentation from repair company indicating seriousness of accident. Changes in Employment/Unexpected Financial Difficulty - Statement from employer indicating employment change/termination; Financial/bank statements. Military Service/Deployment - Military orders showing dates of deployment, training, or service. Reinstatement/Made up Deficit Hours - Official academic transcript review and posting of transfer hours by the NCCU Registrar’s Office. Unusual Enrollment History - Documentation of academic or personal reasons which may explain the failure to earn credits. Students who wish to withdraw from the university for personal, medical, or academic reasons at any time during the semester must complete the Official University Withdrawal Form, which may be obtained from the Registrar’s Office. After the form has been completed and approved by the student’s academic advisor and the Registrar’s Office, the Registrar’s Office will update the student record in Banner. Students who leave the university without completing the Official Withdrawal Form will forfeit their eligibility for refunds of tuition and fees. Students who are unable to appear in person may notify the Registrar’s Office by letter of their intention to withdraw. (It is conceivable that the letters may sometime be sent to deans when the withdrawal is of an academic nature. The dean would then collaborate with the Office of the Dean of Students.) Withdrawals are effective upon receipt and processing of the letter by the Office of the Dean of Students. The student identification card must be submitted with the withdrawal letter before refunds are made for tuition and fees. Students abandoning courses without initiating withdrawal procedures shall receive failing grades. To avoid receiving a failing grade, students must officially withdraw from courses prior to the last day for withdrawing from courses as stated on the academic calendar. Classes from which a student withdraws after the drop/add period count as attempted but not earned hours. Therefore, withdrawing from classes after the drop/add period will negatively affect students’ ability to satisfy the hours earned standard. Audited courses count as attempted but not earned hours. Therefore, auditing classes will negatively affect a student’s ability to satisfy the hours earned standard. When a student repeats a course, the total attempted hours will increase with each repeat, but the student may only earn hours once for a successfully completed course. Therefore, repeating courses may negatively affect a student’s ability to satisfy the hours-earned standard. The university may approve the withdrawal of a student from a course or courses for circumstances such as health, psychological counseling, administrative requirements, or other conditions beyond the control of the student. Such action is called an Administrative Withdrawal and is non-punitive. The student must complete an Official University Withdrawal Form, include any supporting documentation and submit the completed form and supporting documentation to the student’s academic advisor or the dean of the student’s college or school. A grade of “W” is recorded on the student’s transcript if the student is granted an Administrative Withdrawal by the appropriate academic dean upon a recommendation from the vice chancellor for academic affairs. The action of the dean is final and must be rendered either prior to the end of the semester or as soon as the official documentation is received. Student fees are adjusted for any withdrawal based on the university’s regular policy governing refunds (see “Student Expenses” section in this Catalog). Exceptions to the refund policy will be considered only upon the recommendation and approval of the vice chancellor for Academic Affairs. Students may audit courses without credit with the permission of the advisor. The forms to audit a course are available in the Office of the University Registrar, Room 102 Hoey Administration Building and must be completed and submitted to the Registrar before the end of the official drop/add period. Individuals not regularly enrolled as students in the university who wish to audit courses must apply for admission as special students and will be required to pay the regular tuition and fees for the courses audited as is charged for credit courses. NCCU students in regular status will be permitted to audit courses and must pay the same tuition and fees as required for credit courses. Audited courses will not count as credit for any degree program. Students who wish to audit a course must complete a “Declaration of Audit” form in the Registrar’s Office before the end of the official drop/add period as indicated in the academic calendar. North Carolina Central University subscribes to the belief that learning can occur in places other than the classroom and through measures other than those practiced in the regular classroom setting. 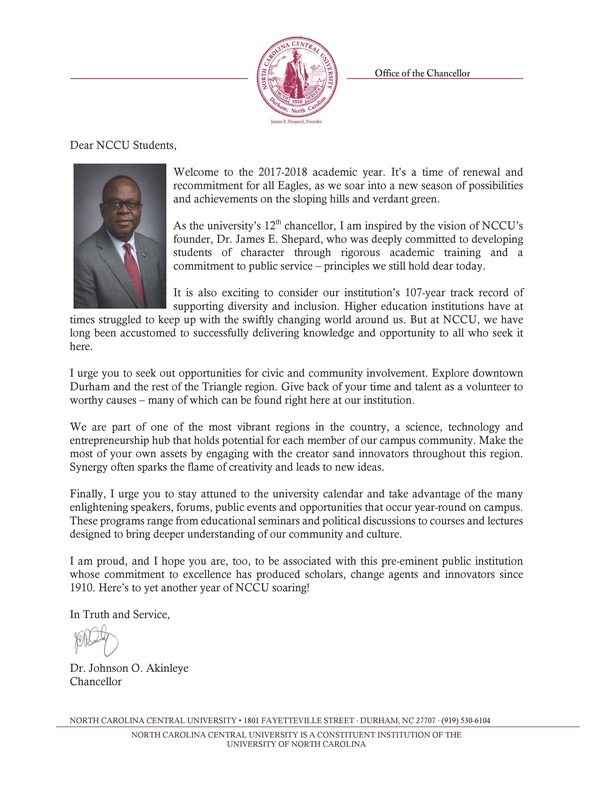 NCCU subscribes also to the principle that undergraduate students should be provided opportunities to demonstrate that skills and knowledge they have acquired outside their normal classroom operations are equivalent to the competencies they attain through their regular classroom activities. Undergraduate students may challenge for credit any course in the General Education Curriculum that has been approved for challenge by the GEC Advisory Council. Undergraduate courses not in the General Education Curriculum may be challenged only with the consent of the department or school in which the courses are housed. Only currently enrolled students may challenge courses, unless the challenging students are members of an official North Carolina Central University program that explicitly includes such challenges as part of the curriculum. Students carrying 15 hours but less than 21 hours in a regular term may challenge, without extra charge, enough eligible courses to make their total hours (enrolled and challenged) equal to 21. Students carrying 15 hours but less than 21 hours may challenge enough eligible courses to make their total of enrolled and challenged hours exceed 21 hours in a regular term, but they will be charged the regular credit hour rate for all challenged hours above 21 hours. Students carrying fewer than 15 hours may challenge eligible courses, but they will be charged the regular credit hour rate for all challenged courses between the number they are taking and 15 credit hours. If the number of challenged hours and enrolled hours exceeds 21, they will be charged the regular credit hour rate for the challenges between the number enrolled and 15 hours, plus the same rate for all hours over 21 hours. If the challenge is conducted through a standardized, externally-supplied test, the students will pay the cost of the test and/or the cost of administering and scoring the test, in addition to the cost, if any, of the credit earned by the challenge. Challenge examinations may be by department-authorized standardized test or by department-developed test. If the test is a department-developed test, the test must be department-approved and withstand the test of reliability and validity. During each semester or summer session in which faculty resources are available, challenges must be completed by 5 p.m. of the 12th business day following the first day of classes. Departments and schools may, in order to administer the challenges efficiently, establish deadline dates for applications for challenges. The departments and schools should publish such deadlines at the beginning of the pertinent semester or summer session when faculty resources are available. The notice should include both the deadline for application and the date of the examination itself. A student may challenge a given course only one time. Passing grades for challenges are A, B, and C only and are reported to the Registrar through channels designated by the appropriate dean. Grades below C will be reported as unsuccessful challenges but will not appear on the student’s transcript or other grade reports. Departments and schools will keep a record of each challenge attempt in order to enforce the provision of No. 10 above. Standardized external test score results will be interpreted from predetermined criteria by individual schools and departments, and reported as A, B, or C grades. Passing grades for challenges will have all the same qualities of grades earned in regular classes. Passing grades for challenges are counted for any purpose for which similar regular classroom course grades are counted. Grades earned through challenges will be so designated on the student’s transcript in order that changes may be ascertained whenever the total of enrolled and challenged hours exceed 21. Challenges are a purely academic matter; hence, all disputes about permission to challenge courses, appeals from grades in challenged courses, and other procedural or substantive questions about the challenge process will be handled through the same procedures and structures established by the appropriate dean for handling such questions for the regular classroom courses. The College-Level Examination Program (CLEP) gives students the opportunity to receive college credit for what they already know by earning qualifying scores on up to 33 college-level placement examinations. Students may earn credit for knowledge acquired through independent study, prior course work, on-the-job training, professional development, cultural pursuits or internships. North Carolina Central University is an approved national CLEP Testing Center through which students may arrange to take examinations in composition and literature, sciences and mathematics, foreign languages, history and social sciences and business. Baccalaureate students will be granted college credit for each test in the battery (five tests) in the award of up to six semester hours of credit in the areas covered by the tests; the total amount of credit granted for all five tests will not exceed 30 semester hours of credit or the equivalent of one academic year. Credits awarded through CLEP by accredited institutions will be accepted on the same basis as other transfer credits from those institutions. Credit will be awarded on the basis of minimum scores. Scaled scores range from 20, the lowest, to 80, the highest, for each 90-minute General Examination. To learn more about CLEP scores and semester credit hours please visit http://www.collegeboard.com/student/testing/clep/scores.html. The scores that appear in the table are the credit-granting scores recommended by the American Council on Education (ACE). North Carolina Central University accepts the score recommendations of ACE for credit-granting purposes. For additional information on the CLEP examinations that are available, contact the University Testing Center at 919-530-7367 or visit the CLEP website at http://clep.collegeboard.org. Students who wish to enroll in courses at other institutions and apply credit for those courses toward a degree at North Carolina Central University must obtain prior written approval of the advisor, the department chairperson, and the appropriate dean before registering for the course. This permission must be filed in the Registrar’s Office before the course is taken. Credit will not be granted for courses taken off-campus for which prior permission to take the course was not obtained. Forms to obtain permission to take a course at another institution may be obtained from the advisors or the appropriate dean. Credit for courses taken at another institution, except through the inter-institutional program as outlined below, is treated the same as any other transfer credit. Credit is given for any approved course work on which a grade of “C” or better was earned. However, the grade received at the institution where the work was completed does not appear on the student’s NCCU academic record nor does it figure into the student’s cumulative grade point average. Only credit for completing the course appears on the NCCU transcript. Students regularly enrolled in a full-time degree program at North Carolina Central University may enroll by inter-institutional registration through NCCU for a course or courses at Duke University, North Carolina State University, the University of North Carolina at Greensboro, the University of North Carolina at Chapel Hill, or the University of North Carolina at Charlotte. Before enrolling in a course at Duke, N.C. State, UNC-G, UNC-CH, or UNC-Charlotte, the student must receive certification from the appropriate dean that the course is relevant to the student’s degree program and that the equivalent course is not available at NCCU. Enrollment by inter-institutional registration during a regular term is limited to one course per semester for an undergraduate student, provided that the student is registered for the balance of his/her normal full-time load at NCCU and is limited to two courses per semester for a graduate (or professional) student, provided that he/she is also registered for at least three credit hours at NCCU. A summer school student must be enrolled in at least one summer school course at NCCU in order to enroll by inter-institutional registration at the other institution. A student taking a course at Duke, N.C. State, UNC-G, UNC-CH, or UNC-Charlotte through inter-institutional registration will be billed by NCCU for all courses taken. There is no additional charge for any fees associated with taking the course. Grading for a course taken by inter-institutional registration will be in accordance with the grading system of the institution where the course is taken. The grade will appear on the student’s transcript and will be counted the same as though the course had been taken at NCCU. Students who desire to complete a course via the inter-institutional program must: (1) register for the required number of courses at NCCU; (2) complete the Inter-institutional Approval Form and the Approval for Inter-Institutional Registration Form; (3) obtain approval signatures from either department chair or advisor and the dean in the student’s school or college; and (4) submit the approved forms to the NCCU Inter-Institutional Coordinator in the Registrar’s Office. The Registrar’s Office will then fax the Inter-Institutional Approval Form to the visiting university’s registrar’s office. North Carolina Central University uses the semester-hour credit and the grade-point system in determining student achievement. A semester hour is the amount of credit earned for the satisfactory completion of one hour a week lecture or recitation or two hours a week laboratory practice throughout one regular semester. No student will be allowed credit for any course in which he or she was not officially registered at the end of the official drop/add period. Grades given for excessive absences from a course are “NW” if the student is dropped from a course before the last day to drop without evaluation, and “NF” if the student is dropped after the last day to drop a course without evaluation. Pluses (+) and minuses (-) are given for law courses only. Students who desire to receive a grade of “I,” or incomplete, should submit a written request to the instructor. Students may be given a grade of “I” at the discretion of the instructor when not all of the work required in the course has been completed for reasons beyond the control of the student. All incomplete grades must be completed according to the agreement between the student and the instructor within the deadline established by the instructor, not to exceed one calendar year from the end of the semester in which the student was enrolled in the course. All incomplete grades for graduating students are to be completed by March 15th for Spring Commencement and October 15th for Fall Commencement. If not, the student will forfeit his/her right to march in the Commencement Exercises. On the Self Service via Banner (SSB): Midterm and final grades may be accessed through Eagles on Line at http://eol.nccu.edu, at the university web site. In person: Students may also report in person to the Office of the Registrar in Hoey Administration Building, Room 102, and request a copy of their grades for the last enrolled term (Photo ID required). Complete instructions for receiving grades are available each semester in the NCCU online class schedule or from the Registrar’s Office. Students entering NCCU in fall 2014 or thereafter are allowed four course repeats without penalty. After repeating a course, the lower grade is excluded from the GPA calculation. After four course repeats, all grades will be included in the cumulative GPA computation. Students may not repeat grades of C or better, but may audit without credit. Students who attended NCCU prior to fall 2014 are allowed five course repeats, with all grades included in the cumulative GPA calculation after the fifth repeated course taken. Transcripts will include all attempts to complete a course, and all attempts will be included in calculations of satisfactory academic progress and tuition surcharge. Undergraduate students are classified as freshmen, sophomores, juniors, seniors, or special undergraduates. Special undergraduates are those conditionally admitted to take courses, but not admitted to a degree program and are not permitted to take more than 12 cumulative hours of course work. The classifications of freshman, sophomore, junior, or senior are based on the number of semester hours a student has completed and earned credits. Curricula plans require a minimum of 124 hours for graduation and a maximum of 128. A Grade Appeals Board shall be selected by each of the following degree granting and other academic units: the College of Behavioral and Social Sciences, the College of Liberal Arts, the College of Science and Technology, the University College, Biomanufacturing Research Institute of Technology Enterprise (BRITE), the Department of Nursing, the School of Education and the School of Business. Faculty representatives will be selected by the respective deans from a list of nominees prepared by the Faculty Senate. Student representatives will be selected by the Student Government Association president from students in each of the respective units. Each board will consist of seven voting members: four faculty and three students and one non-voting member who is the appeals counselor. Each board member will serve a one-year term, with the option of being appointed to a second one-year term at the discretion of the appointing dean or SGA president. A chairperson for the appeals board shall be elected from among the faculty members. A secretary shall also be elected from among the board members. A quorum shall consist of five board members, including at least three faculty and two students. 4. The board member is one of the two principals involved. All questions of scheduling and satisfying deadlines shall be adjudicated by the chair of the appeals board. All records of the Grade Appeals Board shall be kept in a file maintained and preserved by the chairperson of the board. Grade appeals counselors shall be selected by each of the following degree granting and other academic units: College of Behavioral and Social Sciences, College of Liberal Arts, College of Science and Technology, Biomanufacturing Research Institute of Technology Enterprise (BRITE), Department of Nursing, University College, School of Education, and School of Business. Each degree-granting unit will select an appeals counselor and an alternate. Appeals counselors and their alternates will be chosen by the students of the unit from a list of four nominees prepared by the dean of each unit. The University College will select two members to serve as appeal counselors. Each will serve a one-year term. The appeals counselor is an ex-officio non-voting member of the Grade Appeals Board. The president of student government will be responsible for convening the students of each unit for the purpose of electing the appeals counselors. These meetings should take place during the first full week of classes during the fall semester, with the appeals counselor assuming the responsibilities of the office immediately upon election. The grade appeal policy is intended to provide a standardized, formal process for undergraduate students to resolve instances of alleged unfair or improper treatment in academic matters. The policy seeks to protect both students and faculty from acts of caprice, while preserving the integrity of the teaching/evaluation process. The policy is written to be consistent with the university’s concern for due process through a system of appeals. A student is allowed to remain in class during an appeal except in cases where the student’s remaining in class would endanger human life or the integrity of the academic program. Step 1: A student who believes that he or she has been graded unfairly or improperly must first schedule a conference with the concerned faculty member to attempt to arrive at a mutual understanding and to resolve any differences in an informal, cooperative manner. The student must express the appeal clearly, in writing, and listen to the instructor’s rationale. The meeting should be scheduled within 10 class days of the incident or two weeks after the student could reasonably be expected to be informed of the assigned grade. Step 2: If consultation with the instructor is impractical or if the student is dissatisfied with the results of the initial conference with the instructor, the student must seek the assistance of the department chair within five class days of meeting with the instructor. If the instructor involved is the department chair or if a satisfactory solution is not reached, the student should seek the assistance of the appeals counselor. This contact should be made within five days of the meeting with the department chair. The appeal counselor’s role is to guide the student through the remaining steps of the appeals process. In no way is the role of the counselor to be construed as that of advocate for either the student or the instructor. Step 3: A student may choose to file a formal grievance. However, a formal grievance may be filed only after conferring with the appeals counselor. The grievance must include the following: (a) date of incident; (b) date of first meeting with instructor; (c) reasons for which the student contends that the assigned grade is improper or unfair; (d) reasons for which the student believes that the grade should be changed or for why other corrective action should be taken; and (e) copies of any and all pertinent examinations, papers, and other relevant materials. Step 3a: To file a formal grievance, the student must submit four copies of the formal grievance to the counselor. This formal grievance should be submitted on the form designed for that purpose. The grievance must be filed with the Counselor within 20 class days of the initial meeting with the instructor (Step 1). Failure to meet these deadlines forfeits the student’s right of appeal under this policy. Further, it is understood that only issues documented in the grievance statement will be considered at the subsequent hearing. Step 4: After a formal grievance has been filed, the appeals counselor must within two class days forward a copy of the student’s grievance to the instructor, the instructor’s immediate supervisor, and to the chairperson of the unit’s Grade Appeals Board. Step 5: The chair of the unit’s Grade Appeals Board shall convene a meeting of the board not sooner than five and no later than 10 class days after receipt of the grievance statement. In a closed hearing, the student shall present the grievance, including any additional supporting evidence and pertinent arguments. A vote concerning the student’s grade appeal shall be taken by the faculty board members and a separate vote shall be taken by the student board members. If a majority of the faculty group or a majority of the student group vote against the student’s appeal, the student’s appeal is denied. If a majority of either group votes in favor of the student’s appeal, the board shall recommend that the student appeal be granted. Step 6a: If an appeal is determined to be unfounded at the hearing, the chair of the appeals board shall provide written notification of that fact to the student, the faculty member, and the immediate supervisor. Students appealing grades should contact the appropriate dean of the college or school in which the course is offered. Step 6b: If an appeal is deemed valid, the appeals board shall forward its recommendation to the appropriate dean, including a written account of its deliberations and its recommendations for redress. The dean shall take whatever action is deemed appropriate. Step 7: Should either the student or the faculty member be dissatisfied with the decision of the dean, a formal, written appeal may be made to the vice-chancellor for Academic Affairs, who will review all written material and make final disposition of the appeal. This final appeal must be filed within five class days of notification of the decision of the dean. If a student is unable to file an appeal because it is the end of classes for a spring or a summer session, the student must, within 20 days of the end of that session, notify the concerned instructor and department chair in writing of his or her intention to appeal a grade when classes resume in the fall. The timetable described in section C is initiated by the beginning of classes in the fall semester. Step 3: Meet with appeals board. To expedite the matter, the appeals board will establish a time to hear any grievance for which redress is sought. Such a time for hearings should be set not less than 24 hours before the graduation ceremony is scheduled to begin. Final examinations periods are scheduled for each semester. The schedule is released about mid-semester and provides that examination periods be three hours in length and that no student should take more than three examinations within a single day. A student who has more than three examinations scheduled for the same day should first try to make arrangements with his/her instructors to have one of the examinations rescheduled. If unsuccessful in this attempt, the student should contact the dean of his/her college or school no later than the last day of classes. The dean will make arrangements for one of the examinations to be rescheduled. All new freshmen, sophomore, and new transfer students will contact the dean of the University College. Final examinations must be given at the time indicated on the final examination schedule unless rescheduling has been approved by the appropriate dean before the last day of classes for the semester. Some undergraduate courses have final examinations scheduled at a common time for all sections of the course. Whenever a student has a regularly scheduled final examination at the same time as the common examination, the common examination has precedence over the regularly scheduled examination. The instructor of the class with the regularly scheduled examination must make arrangements for that student to take that final examination at another time. Grades for the semester are due 48 hours after each final examination is given. Seniors in their final semester may obtain special permission to register for 5000-level courses only if they lack no more than 9 semester hours of undergraduate credit. This privilege applies ONLY during the final semester of the student’s undergraduate work, and permission is extended ONLY if the student has maintained a grade point average of at least 3.0 in his/her major. Seniors wishing to register for a 5000-level course should obtain permission from the dean of their college, school or academic unit; and must present this permission at the time they are registering for the class. A student’s total registration (undergraduate and graduate credit) may not exceed 15 semester hours. Graduate credit for course work completed under this arrangement will be granted upon the student’s admission into a graduate program only if the course or courses did not count toward fulfilling the 124 hours minimum required for the bachelor’s degree and if the course or courses were not used to fulfill the hours or requirements of the undergraduate major. Students who left the university in good academic standing will be eligible for readmission. Readmission is completed on-line on the university website. Does not complete, unless the course was officially dropped by the student pursuant to the academic policy of the appropriate constituent institution. All transfer credit hours accepted by North Carolina Central University, including those hours accepted as electives and not applicable to the student’s program of study. Upon application by a student, the tuition surcharge shall be waived if the student demonstrates that any of the following have substantially disrupted or interrupted the student’s pursuit of a degree: (i) a military service obligations, (ii) serious medical debilitation, (iii) a short-term or long-term disability, or (iv) other extraordinary hardship. The student must complete and submit to the Office of the Registrar a Tuition Surcharge Waiver Request Form within 30 business days of receiving written notification of a tuition surcharge fee from the Office of Student Accounting. The Registrar’s Office will forward the request to the Tuition Surcharge Waiver Committee for a decision. The Tuition Surcharge Waiver Committee is comprised of four members. The committee will review all pertinent documents relative to the Tuition Surcharge Waiver Request Form in determining a decision. A favorable or unfavorable decision will require a majority vote by the committee. The student shall be notified in writing by the committee of the decision within 30 business days. The Office of Student Accounting and the Office of the Registrar shall be notified in writing by the committee of the decision within 30 business days. Any student who has attempted more than 168 hours toward a single undergraduate degree will be dismissed from the university. Students who are working toward two undergraduate degrees simultaneously may register for hours in excess of 168 only with special permission from the appropriate dean. Attempted hours also include courses graded “WC,” “NW,” “NF,” and “I.” Deans also may make exceptions in cases where students have transferred more than 44 hours from other institutions. In these cases, only transfer hours that apply toward the NCCU major will count toward the 168 hours attempted. Academic Forgiveness is a process which allows students to both resume their studies at North Carolina Central University after a period of non-enrollment and potentially mitigate the impact of previously earned unsatisfactory grades. Students sometimes are forced to withdraw from the University for either academic and/or personal reasons, but upon return, find that their attempts to gain admission to a program or apply for scholarships are hindered by their prior academic record. Academic Forgiveness permits students with an opportunity to renew their efforts to resume their education with the University and demonstrate that they are now prepared for academic success. not have been enrolled at North Carolina Central University for a period of at least three (3) years. All eligible students who are interested in seeking Academic Forgiveness must contact the chairperson of the department in which they were previously enrolled. The chair of the department, upon review of the student’s academic record, will then recommend to the Dean of the school at issue that the student be readmitted. The Dean will then contact the University Registrar and ask them to offer the student a conditional readmission for the sole purpose of seeking academic forgiveness. maintain, pursuant to the University’s Fostering Undergraduate Student Success Policy, a minimum course completion rate of 67 percent of attempted hours for each semester of enrollment. Once the student has completed the above-referenced requirements, he/she must complete an application for Academic Forgiveness and submit it to the chairperson of the Undergraduate Admissions Standards Committee. The application shall include a letter of intent from the student, an approval form from his/her advisor, and a copy of the student’s transcript, which should include the grades earned in the semester of return. The committee will review the application, and if it is deemed successful, the committee will notify both the student and the University Registrar of the successful petition. The petition will then be forwarded to the Provost’s Office for final approval. A successful petition for Academic Forgiveness will result in the forgiveness of all grades of less than “C” the student earned in their prior enrollment. While all grades will remain on the student’s transcript, only the classes in which the grade earned was a “C” or better will count toward their graduation and cumulative GPA. Students should note, however, that all coursework, including that of the initial enrollment attempt, count toward their total of attempted hours. A successful petition will also result in a notation of “Academic Forgiveness” on the student’s transcript in the Office of the University Registrar. The Academic Forgiveness Policy does not impact a student’s financial aid eligibility. Any student who was previously not meeting Satisfactory Academic Progress and subsequently granted academic forgiveness must submit a financial aid SAP appeal to be considered for financial aid eligibility. In calculating students’ academic progress for federal aid eligibility, the University cannot ignore credits attempted or grades earned from previous periods of enrollment. Students should therefore be prepared to pay all charges owed to the University until a decision is made on the Financial Aid Appeal and financial aid may be awarded. Successful Academic Forgiveness petitions will only apply to grades obtained at North Carolina Central University. It does not apply to coursework from other post-secondary institutions. Students may only receive Academic Forgiveness once. Students who receive a conditional admission solely for the purpose of academic forgiveness but who do not meet the stipulations regarding GPA, completed hours, or do not score at least a “C” in each course during their first semester will be denied full-time admission to the University. Students who complete a minimum of 15 hours in a given semester and who make an average of 3.0 or above for that semester, without any grade lower than “D,” are considered “honor students.” The Honor Roll is divided into two groups. Those students who have a grade point average for the semester of 4.0 are on the “A” Honor Roll while those students who have an average of 3.0 to 3.99 are on the “B” Honor Roll. The Dean’s List is composed of all juniors and seniors on the Honor Roll for the semester who also have a cumulative GPA of 3.0 or higher. The University Honors Program is an academic program within the Department of Academic Affairs at North Carolina Central University. The University Honors Program (UHP) is designed to enroll, reward, and prepare academically gifted students, encouraging them toward intellectual initiative and independence. These students, selected for their outstanding academic achievements, and monitored throughout a rigorous four-year matriculation, will be prepared to pursue advanced degrees in highly competitive graduate or professional programs and to assume leadership roles in their professions and in society. The University Honors Program enriches the learning experience by providing the student every possible opportunity for reaching a level of maturity, independence, and scholarly achievement that might not be possible without such a program. UHP is specifically committed to preparing globally astute and engaged community leaders. Student completing the University Honors Program will 1) develop effective community leadership skills from dynamic, innovative, and exceptional faculty; 2) demonstrate effective problem solving of contemporary issues through critical thinking, analysis, and collaboration; 3) identify and engage global issues, their context and ramifications in our world; and 4) develop refined research, writing, and communication skills through rigorous preparation. High achieving students are encouraged to apply to the University Honors Program. High school applicants must have either a 1500 on the SAT or a 23 on the ACT. Current college and transfer students are also encouraged to apply and must have a minimum cumulative GPA of 3.3. The University Undergraduate Research Program is intended to provide a select number of talented and highly motivated students with one-to-one mentorships with faculty members. The purpose is to promote scholarly activity by providing enhanced opportunities for structured, definitive, and meaningful research involvement. Interested students who have a cumulative grade point average of at least 3.0 may get additional information by contacting the deans in the College of Behavioral and Social Sciences, College of Liberal Arts, College of Science and Technology, School of Education, School of Business, or the director of Undergraduate Research Program. There are numerous academic awards and prizes given by the university and its departments. These awards are presented at the annual Honors Day Convocation, usually the first Friday in April. All students, faculty members and parents are invited to this event to honor the university’s most talented students. The Chancellor’s Award for Academic Excellence is the university’s top academic award and is presented each year during Honor’s Convocation. The recipient must be eligible to complete the requirements for graduation during the current academic year, must have completed at least seven consecutive regular semesters at NCCU as a full-time student (enrolled in a minimum of 15 semester hours each term), and must have earned a GPA of at least 3.8. The GPA will be calculated using only work completed at NCCU. The award will be made to individuals whose character and academic achievement demonstrate the capacity for real service to the nation. The University Award for Academic Excellence is given each year during the Honors Convocation Program. The recipient must complete the requirements for graduation during the current academic year and complete at least 50 credit hours at NCCU. The recipient must have attended NCCU for at least four consecutive regular semesters and earned a cumulative GPA of 4.0. while carrying a minimum load of three courses or nine credit hours. The GPA will be calculated using only work completed at NCCU. The student named for this award must meet all qualifications listed above. 4. A minimum cumulative grade point average of 2.0. 5. In most degree programs grades of “C” or better are required for all courses in the major. 6. All incomplete grades for graduating students are to be completed by March 15th for Spring Commencement and October 15th for Fall Commencement. If not, the student will forfeit his/her right to march in the Commencement Exercises. 7. The Community Service requirement for graduation is 120 hours. Since requirements vary from major to major, students should consult the sections of this catalog pertaining to their specific area of interest for the precise degree requirements of that academic area. Undergraduate students seeking North Carolina licensure and majoring in education, including health education and physical education and seeking licensure must also complete a second major in an approved academic program. Students should consult the “Health Education,” “Physical Education,” and “School of Education” sections of this catalog for listings of approved academic second majors. The final 30 semester hours of course credit must be completed at North Carolina Central University. Graduation exercises take place in May and December, and diplomas are awarded only at those times. However, graduation will be certified at the end of the term in which all academic requirements are completed and that term will appear on the student’s transcript as well as the diploma. Application for graduation must be filed in the Office of the University Registrar on or before the dates specified in the University Calendar of Events. Applications received after the deadline will not be handled until the next term, and diplomas will be delayed accordingly. The faculty advisors, deans, and the registrar try, in advising and registering students, to make certain that every student who intends to graduate from North Carolina Central University registers for those courses which are required for a degree. However, the final responsibility for meeting the graduation requirements as set forth in the University Catalog rests with the students. A student who is admitted into a degree program at North Carolina Central University during any academic year and who earns credit for work done during that year will graduate under the academic requirements of the student’s major listed in the University Catalog in effect at the time of the student’s matriculation, unless otherwise indicated. A student who is readmitted after an absence of one academic year, or who changes majors, will graduate under the provisions of the University Catalog in effect at the time of readmission or change of major. In as much as the annual commencement exercises at North Carolina Central University are held in recognition and celebration of the earning of degrees, only those persons who have satisfactorily completed all of the requirements for their respective degrees, including all financial obligations, and who have been officially certified for graduation, will be allowed to participate in the traditional May and December commencement exercises. Undergraduate students may major in two separate disciplines with the permission of the chairperson of each of the departments and the appropriate dean(s) and on the condition that they meet the requirements for each major. Students who meet the requirements for a double major will receive a diploma for each degree. At the time of graduation, the official transcript will indicate both majors. A student who already holds a bachelor’s degree may receive a second baccalaureate degree if he/she fulfills all requirements for the second degree and completes a minimum of 30 hours in residence beyond the requirements of the first degree. First-degree transfer students who have earned a minimum of 60 semester hours at NCCU and meet the cumulative GPA requirements stated above will be awarded a Degree with Distinction. First-degree transfer students who have earned between 30 - 59 semester hours at NCCU will be awarded a Degree with Distinction if the average of GPAs from all institutions previously attended and at NCCU meet the cumulative GPA requirements stated above. Second-degree students who have earned a minimum of 30 semester hours at NCCU and meet the cumulative GPA requirements stated above will be awarded a Degree with Distinction. Please allow two business days for the processing of transcripts. A student who requests to pick up their transcripts in the Registrar’s Office must do so within two weeks of processing. If not picked up within the two weeks, the transcripts will be mailed to the student. The cost of an official transcript is $10.00. Payments may be made telephonically to the Bursar’s Office. Office hours are 8:30 a.m. to 4:00 p.m. The number is (919) 530-6209. Once payment is made, a confirmation number will be given to the student. A written request with signature may be faxed to Office of the Registrar. The fax number is (919) 530-7974.
g. confirmation number given by the Bursar’s Office to show proof of payment. 2. Please complete in your request the information stated above in item 3, option 1. 3. Note: No personal checks are accepted. Students may complete a Transcript Request Form in the Office of the Registrar, Room 102, Hoey Administration Building during normal duty hours 8:00 a.m. - 5:00 p.m. The cost of an official transcript is $10.00. Payments will be made in the Bursar’s Office. Two receipts will be given to the student. One is to be attached to the Registrar’s Office copy and the second receipt is for the student’s records. Once payment is completed, please turn in the request to the Registrar’s Office. All indebtedness to the university, including requirements of any loan programs in which the student participated, must be satisfactorily settled before a diploma or transcript will be issued to the student. Continuing students who have an outstanding balance on their student accounts will not be permitted to pre-register, register, or receive grades until the balance has been paid in full. Each student is required to notify the Office of the University Registrar in writing of any change in name or mailing address for grades, bills, registration information, and other materials. A student’s name is changed only upon presentation of an official document such as a marriage license, birth certificate, or court order. For historical reasons, a student’s name is not changed on his/her records for any reason after that student is no longer enrolled at North Carolina Central University or on any records for which that student has already received a degree.